Plushies, also commonly called stuffed animals, are one of the more common items amongst adult babies. Many people have them as children and they can continue to be faithful companions beyond childhood. Fortunately, they are one of the easiest AB items to obtain, even for those who aren’t able to get diapers, pacifiers, etc. Plushies are fairly common items so they aren’t very difficult to find. If you’re lucky, you may still have some in your house from when you were younger but if not, you’ll have to buy new ones. If you can’t get to the store without being driven by your parents, you can tell them that you want to go to the store to buy something as a gift for a friend and buy a plushie using that pretext. Be aware that if you do this, you must keep the plushie hidden as you may be questioned about why you still have it if it was supposed to be a gift. Plushies can be found at any toy store (e.g. Toys-R-Us), any store that has a toy section (e.g. Wal-Mart), or at just about any souvenir or gift shop. If there is a Build-A-Bear Workshop near you, you should consider going there as, in addition to giving you the ability to design your own plushie, their selection of plushies is greater than what you would find in other stores. Plushies aren’t that expensive but before you go to the store to buy one, you should look at the store’s website to get an idea of how much it would cost. Plushies can also be obtained by ordering online. The advantage to this is that there is a much wider selection of plushies available but the downside to this method is that it’s harder to judge if you really want a certain plushie based solely on pictures. Buying plushies is nowhere near as difficult as buying other AB/DL items. Unlike diapers, plushies are common enough amongst the general population that no one would bat an eye at an adult buying one. A plushie isn’t even the sort of thing that would make anyone question why you might be buying it. If, however, you’re worried that you’ll be asked about it, a good excuse is to simply say that it’s a gift for a younger sibling. If you say that, you will not be asked any further questions about it. The difficult part of buying a plushie is finding the one that’s right for you. Before you go to the store to buy one, you should try to have an idea of what kind of plushie you want to get but you should not limit yourself to what you’ve chosen. Look around the store, see which plushies jump out at you, and make your decision when you’ve had time to look through what’s available. Now that you have a plushie, you should consider giving it a name. While this certainly isn’t a requirement, you’ll find that it’s easier to emotionally associate with it if you can refer to it by a name. Given the nature of plushies and the common perception of them being something for children, you may want to keep your plushie hidden from the people around you. They might react negatively to you having a plushie or you may simply not want to have to explain it to them. In this case, you should hide it in a spot that no one other than you would have a reason to look. Plushies are typically small enough that you can safely hide them in the back of a drawer but if that won’t work, try to find another place which is big enough but where others will have little inclination to look, such as an old box. However, if you don’t think that the people around you would react negatively to you having a plushie, hiding it may not be necessary. If you know that your parents, siblings, roommates, etc. wouldn’t care about you having a plushie, you could get away with leaving it out in the open. If asked about a new plushie, you could claim that it was a gift from a friend that you thought was cute or that it was simply something you saw when you were at the store and wanted to buy. If asked about an older plushie, you can say that you liked it when you were younger and you took it out of storage for nostalgic reasons. If you want to sleep with your plushies, you’ll need to exercise a degree of caution, especially if you get woken up in the morning by someone else. The simplest solution is to hold your plushie under your blanket when you go to sleep, although this still runs the risk that you might move around in the night and expose your plushie. You should try to get used to sleeping with a plushie on nights when you know you won’t be woken up by someone the next morning. If someone catches you sleeping with your plushie, you do not need to tell whoever caught you about your AB side. Instead, you should try to pass it off as an eccentricity of yours. It’s important to remember that plushies are common enough that people will not link them to infantilism should they see you sleeping with one. People generally aren’t aware of infantilism so the chances of them deducing that you are an infantilist based on your act of sleeping with a plushie are incredibly slim. Every now and then, your plushie will need to be cleaned. If you leave it lying around, it can become dusty and if you sleep with it on a regular basis, it can accumulate oils and sweat from your body which can lead to a buildup of bacteria. Before you clean your plushie, look at the label; it should tell you whether the plush is machine washable or surface washable. If the tag is missing, too faded to read, or doesn’t state how the plush should be washed, it’s best to play it safe and surface wash it. It’s important that you do not use any chemicals (such as bleach) when cleaning your plushie since doing so can cause irreparable damage. If the plushie is machine washable, you can wash it by putting it in a pillowcase, tying the pillowcase shut, putting it in the washing machine, and washing it on a gentle, cold-water cycle using a small amount of laundry detergent. After you’ve washed it, keep it in the pillowcase and put it in the dryer on the lowest heat level for approximately 20-25 minutes. If your plushie is still damp afterwards, put it back in the dryer for another 10-15 minutes. Here are two models of the same surface washable plushie. The one on the left has been washed by being repeatedly submerged in water; it has a more faded color as well as a damaged eye. For surface washable plushies, start by filling your sink with water and adding some detergent or soap to it. Next, take a washcloth or a sponge, soak it in the water, and gently scrub your plushie’s fur with it. After you do this, use a dry towel to remove as much moisture as possible and then dry it off completely by leaving it in the sunlight or by using a hair dryer on the low setting. 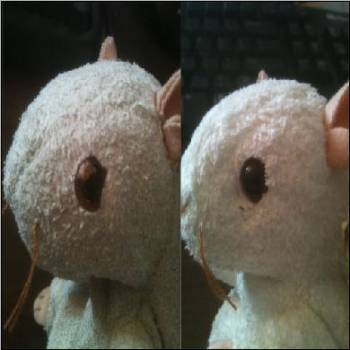 Smaller plushies, such as TY Beanie Babies, can be cleaned using baking soda. To do this, put one cup of baking soda into a Ziploc bag, put your plushie inside, seal it, and shake the bag so that the baking soda covers the whole plushie. Let it sit like that for approximately two hours. After that, take it outside, shake the baking soda off of it, and use a brush to get rid of any remaining baking soda. Always willing to give help to those who seek it. Rainbow Dash is awesome. So to answer your question, no. Check out Vermont Teddybears. They're amazing, and have really big ones, I love that they have weighted bean bag paws. Feels like a hug. I consider myself somewhat of a plushie connoisseur. I have a large collection of them in my room, all different species and brands. I’ve even taken up sewing because I’m so picky about the specifications of my plushies that I like making them myself so as to have complete control over the whole thing. Anyone who’s interested can check out some of my work on deviantart by searching for my name, raspie aspie. I’m considering starting an Etsy shop to sell them in, so if anyone is interested, let me know, I can do custom orders based on patterns I’ve previously used. Sorry, it’s raspieaspie, no space.